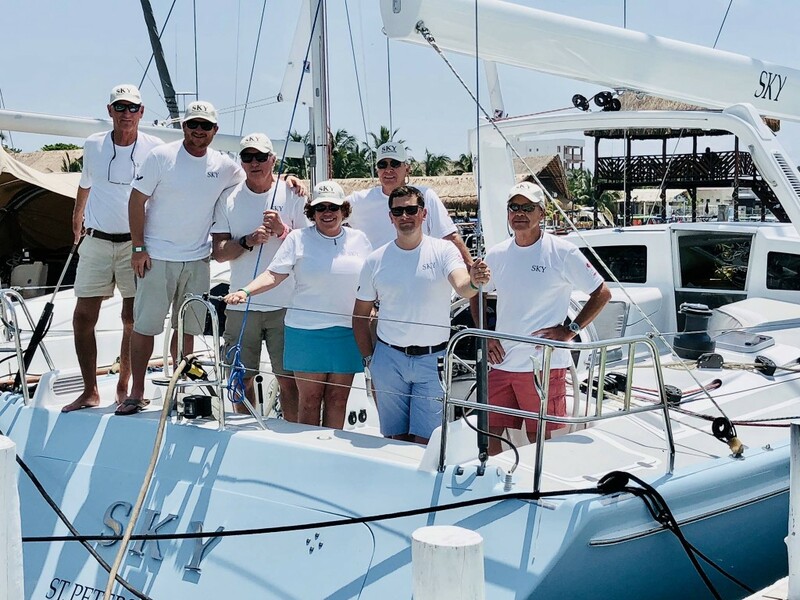 The 50th Annual Regatta del Sol al Sol started at the Saint Petersburg Yacht Club in St. Petersburg, Florida and finished on the beautiful island in the Mexican Caribbean, Isla Mujeres, just off the coast of Cancun. 30 Boats were on the scratch sheet, I was aboard SKY, a custom Vaudery Miller 57 owned by my friends Johannes ‘Jopie’ Helsen and his partner Heidi Trilsch. Jopie, 50 years prior, raced in the first Regatta del Sol al Sol in 1969. The race started on a blue-sky Friday morning with winds at 10kts out of the west. After passing under the Sunshine Skyway there was nothing but open water ahead for 456 NM! We had a rather motley crew of experienced sailors, including Charlie Ball, Linwood Gilbert, Karan Park, Dan Driscoll with Doyle Sails, Herb McCormick senior editor of Cruising World Magazine, and our videographer Chris Gourley. This wasn’t just a race for SKY, it was truly the first shakedown sail she’d seen after undergoing an extensive refit at Sailors Wharf. New sails outfitted by Doyle Sails, a carbon fiber Leisure Furl boom, all new B&G electronics, major systems improvements, and a fresh paint job. The boat came together well and throughout the race, we only had a few kinks to work out. For the first day and a half, we were able to ride the rumb line with favorable winds out of the northeast at about 13 knots. While most boats dropped out of sight, we kept within a mile or two of Wasabi, a Farr 395. We were able to make use of the loop current, a clockwise rotational current in the center of the Gulf of Mexico, and picked up an extra 2 knots. With winds shifting more out of the north at 15 knots, we opted to split from Wasabi and head south, cutting across the Gulf Stream and trying to avoid as much as possible the strongest of the current between Mexico and Cuba, all the while knowing at some point we’d have to cross it. Just after 2 days into the race, the first boat crossed the finish line, Merlin, the legendary Bill Lee custom that’s been prowling races since launched in 1977. A true sled of a boat! Merlin was followed closely by Sgt. Reckless a Tripp 75, of the Warrior Sailing organization, and crewed by wounded warriors. An incredible group of sailors! Meanwhile, shortly after their finish, we encountered our first set back. Off watch and sound asleep in my berth directly under the starboard quarter I was awoken by a loud SNAP, followed by a string of words from the cockpit that you’d expect from sailors under those circumstances. The halyard on the spinnaker chaffed through and the sail was now dragging along the hull. All-hands-on-deck and we had the massive sail lashed down and a new kite up in under 20 minutes. Under the second spinnaker, we made our way about 35 NM off the coast of Cuba before heading west just before our third sunset at sea, to cross the Gulf Stream. With north-northeast winds at about 14 knots and 4.9 knots at its strongest of opposing current, the seas stacked up and gave us quite the ride for the next 12 hours. It was an incredible night of sailing and the boat and crew handled it well. As we made our way south for the final leg, Wasabi rejoined us about 4 NM off our bow, finishing just 30 minutes ahead of us. We crossed the finish line just after4AM on Monday morning. The entire island of Isla Mujeres welcomed the crews and celebrated our arrival with several events hosted throughout the week. Most of the boats gathered at the El Milagro Marina but the sailors found their way to their favorite watering holes, such as the Soggy Paso where I dutifully left my hat pinned to the wall like so many others before me. SKY took 1st in the Cruisers-A Class and 2nd overall, a spectacular finish! Also, in our class were two boats sold by David Walters Yachts some years back, a Hylas 54 named Split Decision and a Hylas 49 named It’s Only Money, whose crew I had the pleasure to catch up with after the race.